Big fat Indian weddings are the norm than exception these days. When it is a wedding in India, it is meant to be no holds bar. However, Kerala recently witnessed a wedding ceremony with a difference – one that was promoting a strong message of ‘Go Green’ and reduce wastage. 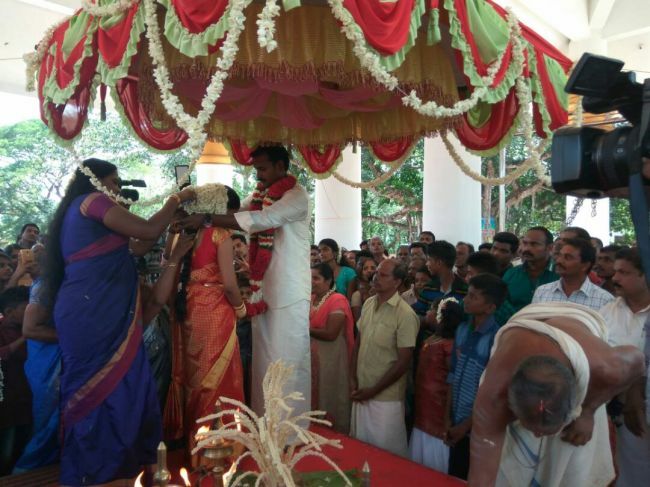 This was the wedding of 28-year-old Arun Anirudhan and Anju Rajendran who tied the knot with each other on May 10 at Aravukadu Devi Temple in Alappuzha. Arun Anirudhan, a government official working in Agriculture Department and Anju Rajendran always wanted a simple wedding affair, that’s when they decided they will have a ceremony that will promote green living. We are happy to start this new chapter of our life on a greener note. Usually wedding affairs create lot of harm to the environment, we wanted to avoid that. When there is a wedding, one will see large amounts of plastic waste littered in every corner of the venue or house. As a couple, together we decided to change this practice and promote the idea of eco-friendly wedding, said the couple while speaking to NDTV. In support of the state government’s Green Protocol, everything for this wedding starting from the stage decorations, to food and gifts, to garlands designed for the couple were made of things that are eco-friendly and does not lead to pollution. Usual plastic and disposable cups/plates were replaced with cutlery that was environment friendly and instead of flower decorations, coconuts and fruits were used. Solid waste management is a huge problem in Kerala as there are so many people living here. Usually waste generated is dumped into the water bodies polluting the environment. Worried about the situation, the state government started ‘Green Protocol’ programme. The thumb rule of the programme is to generate less waste, as once that is taken care of, disposing of waste becomes an easy task, said Bijor Verghese, District Coordinator for Suchitwa Mission. With an aim to make Green weddings a mainstream phenomenon, the state government under Green Protocol programme has started educating the religious and social organisations about how to organise the eco-friendly, plastic-free and zero waste marriages. The idea is simply to educate people to do less wastage and do away with disposable items, including plastic plates, glasses and other decorative items and instead opt for reusable items. One wedding approximately leads to 100 kilograms of waste generation, if everyone starts adopting this green protocol just like this newlywed couple then Kerala can soon fulfill the dream of becoming a Swachh state, added Mr Bijor. 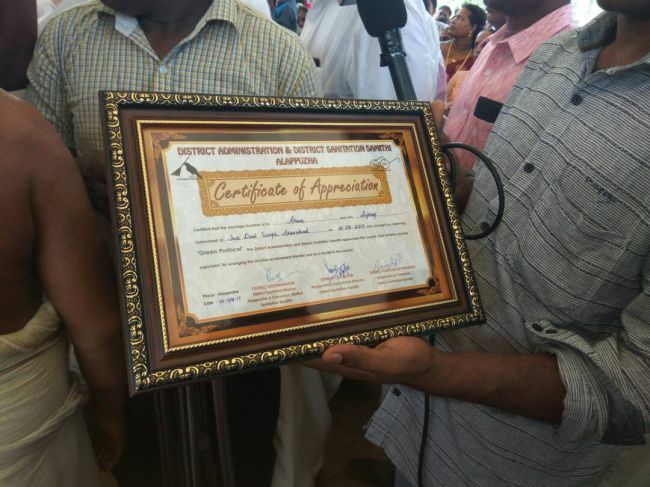 The green wedding was witnessed by over 1000 guests and the couple was given a certificate of appreciation by the District Collector, Veena N Madhavan and district Panchayat President, G Venugopal and several local dignitaries who attended this green affair. Previous Post: Bengaluru Family Sets New Travelling Goals By Going Green. Takes The Zero-Waste Route For Their Trip To The Northeast. Next Post: Paper Waste Into Creative Paper Meet The Man Who Invented ‘Beej-Kapas’.